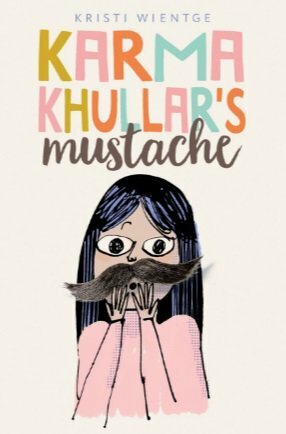 I randomly picked up Karma Khullar's Mustache at the library because of the cute cover. What I got was a sweet novel about growing up. Puberty is a well trod path in middle grade novels, but I've never come across a book about female facial hair. Now that I think of it, that's really surprising because it's such a common issue. I remember being in the sixth grade and desperately wanting to shave my legs. There are also many photos of me with pencil thin eyebrows. Karma had it worse: a budding mustache and religious beliefs that prohibit cutting hair. She and I solved our problems pretty similarly: taking care of it on our own and then having a larger issue to deal with. While the facial hair is a major plot point, this is also a book about growing apart from childhood friends and about bullying. The ending is sweet, but it isn't saccharine and fairly realistic. There is a religious turn at the end that surprised me, but it was fairly minor. I enjoy having this book in my list of recommendations. Obviously, I wouldn't hand it to a child with facial hair, but a book talk early in the year (before puberty kicks in) could lead readers who need it to Karma Khullar's Mustache.